Sirens has a mission: to provide a welcoming space for our attendees to discuss the remarkable, diverse women of fantasy literature. 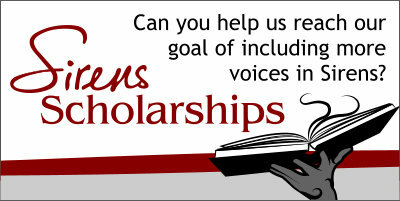 Each year, Sirens raises funds to provide scholarships to help a number of people attend Sirens and add their voices to those conversations. Our scholarship fundraising will continue through March, but this week, we want to highlight the importance of our scholarships for those with financial hardships. In past weeks, we discussed our scholarships for people of color and those submitting exemplary programming proposals, and those with financial hardships. New this year, we are asking the Sirens community to raise funds to help some of these professionals attend Sirens. Assuming that we reach our fundraising goals, we will provide a Sirens registration and round-trip shuttle ticket to one librarian, one educator, and one publishing professional (which may be anyone from an editor to an agent to a publicist to a cover designer to a bookseller). As part of the application process, we will ask for a resume and a statement of interest. If you can—whether that’s $5 or a full scholarship of $365—we hope that you’ll help us provide these scholarships!